Hello friends! It’s Andy Gesner and the HIP Video Promo staff, here with the latest from one of the world’s most ambitious and exciting pop bands, and a returning HIP client whose success we’ve taken a special interest in. Over the years, we’ve had the pleasure of watching Maxïmo Park grow from a local Newcastle curiosity to a star attraction. The offbeat Geordie quintet has defied long odds to join the ranks of the biggest bands in Britain – and they’ve developed a substantial stateside following, too. Back when we helped spread the word about their first American video (the indelible “Apply Some Pressure”), there were still some questions about the act’s long-term prospects: could musicians who showcased their intellect connect with a mass audience? Was the public ready for a rock band that subverted verse-chorus-verse expectation so boldly? Would Paul Smith’s complex perspective and bravely-literate storytelling scare away the crowds? Turns out the optimists were right: four years later, as we await the release of the band’s third full-length and fourth collection of new material, U.K. enthusiasm couldn’t be higher. 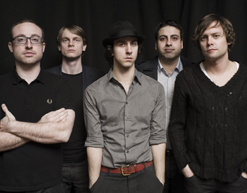 And after several successful trips to these shores, Maxïmo Park is poised for their U.S. breakthrough. Those Americans who’ve seen Maxïmo Park in action have learned what Brits have known for years – few bands bring such fire to the concert stage. This summer, they’ll be headlining the massive Reading and Leeds Festival in support of Quicken The Heart, the upcoming album. And judging by “The Kids Are Sick Again”, the debut single, this set will be as propulsive and kinetic as their prior releases. “Kids” is a tale of summer ennui and suburban conformity; Paul Smith writes with the incisiveness that has become his hallmark. His images are sharply-drawn, his language is bold (“billboards evanesce under regular beams of light”, he sings, “toothpaste smiles don’t seem so bright”), and the band backs him up with tough, angular, futuristic-sounding rock. One of the many things that distinguishes Maximo Park from their peers is the prominent role played by their synthesizer player: Lukas Wooller’s elastic analog leads are as integral to the band’s sound as Duncan Lloyd’s geometric six-string, Archis Tiku’s thunderous bass, and Tom English’s murderously-precise drumming. On “The Kids Are Sick Again”, Wooller takes the spotlight – it’s his acrobatic synth that provides a dazzling counterpoint to Paul Smith’s dramatic vocals. For a super-hip British band, Maxïmo Park has never been crippled by fashion-consciousness: their taste in clothing has often been as idiosyncratic as their music. Which isn’t to say that they aren’t a terrific-looking group – onstage, their single-minded intensity is arresting. The members of Maxïmo Park look like talented musicians should; when they’ve got instruments in their hands, they carry themselves with confidence and rare dignity. Consequently, most of their videos have been performance clips – and “The Kids Are Sick Again” is perhaps their most characteristic. The band plays in a darkened room, and each instrumentalist is partially illuminated by an individual LED light. The members of Maxïmo Park are mostly shadow, but we catch movements, facial expressions, gestures that suggest a formidable level of concentration. The footage has been digitally altered: frames have been removed to make all motion appear sudden and deliberate. It is a genuine pleasure for us to once again be working in tandem with Priya Dewan and the Warp Records team, and to once again have the opportunity to champion Maximo Park. If you need more info, call Andy Gesner at 732-613-1779 or e-mail us at info@HIPVideoPromo.com . You can also visit www.WarpRecords.com or www.MaximoPark.com to find out more about Maximo Park.